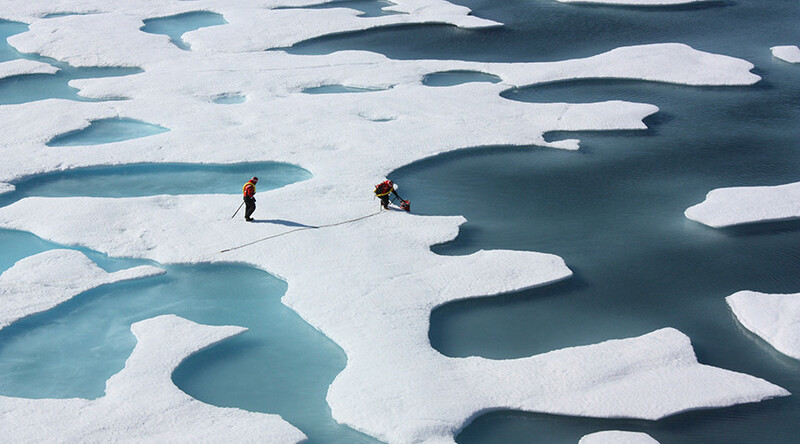 A new study suggests that widespread melting Arctic ice may actually be benefitting life in the region. "When all the sea ice melts during the summer, algae and other organisms from melt ponds are released into the surrounding seawater,” Heidi Louise Sorensen, lead author of a study conducted by The University of Southern Denmark said, as cited by Phys.org. While the phenomenon of melt ponds in the Arctic has been observed for decades, scientists could not fully determine what key factors created an ecosystem within them and whether it would thrive or fail to form altogether. The key ingredient, as noted by Sorensen and her team, is the type of nutrients which find their way into the melt ponds, namely minerals such as phosphorus and nitrogen. These nutrients make it onto ice floes in a number of ways, from waves and storms to migratory birds. Climate change has created more severe weather patterns and with choppier seas and more intense storms, scientists now believe the Arctic will witness ever more fertile periods of growth within these micro ecosystems and beyond. "Given that larger and larger areas of melt ponds are being formed in the Arctic, we can expect the release of more and more food for creatures in the polar sea," Sorensen added. These melt ponds allow increasing amounts of algae and bacteria to form which provide additional food resources for certain kinds of animal life both near the water’s surface (such as krill and copepods, which are in turn eaten by larger creatures such as whales and seals) as well as on the seafloor (starfish and sea cucumbers). “Some of this food is immediately ingested by creatures living high up in the water column. Other food sinks to the bottom and gets eaten by seabed dwellers," Sorensen said. For context, NASA satellites measured the smallest ever amount of sea ice in the Arctic after a record year in 2016, which saw warmer temperatures drastically impact the size and distribution of ice floes. In the 38-year history of satellite records, the National Snow & Data Center (NSIDC) noted that, as of March this year, sea ice levels were at their “lowest maximum” ever recorded.